about Algae | Efficient Sonics Ltd. 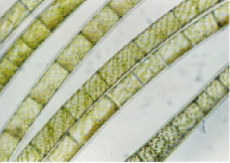 There are six taxonomic divisions of algae, namely: Chrysophyta, Pyrrophyta, Phaeophyta, Rhodophyta, Chlorophyta and Euglenophyta. Chrysophyta is a large division of algae, with over 6000 unicellular species falling within this group, including diatoms and golden algae. The Pyrrophyta division of algae mainly appear in the form of plankton that can either be found in freshwater or saltwater. The biflagellate in the algae can cause severe environmental and health risks when they secrete a toxic poison, which may kill many organisms in the water. There are over 1000 species of algae within this division. Phaeophyta, commonly referred to as brown algae, is an algae division containing over 1000 species. Species within this division vary in size with some species being impossible to see with the naked eye, whilst others are in the form of large seaweed reefs. This saltwater algae division can cause problems for boat owners, as many species within this division cause fouling on boat hulls and engines. Rhodophyta (known as red algae) is a division of algae containing almost 4000 species. They grow on hard surfaces or on different algae species to form threads up to 100m long. They primarily live in salt water and can become problematic as they become strongly encrusted with minerals, which solidifies their structure. The Chlorophyta division of algae is commonly referred to as green algae, as it forms together in light green dense clumps . It is usually found in freshwater, and over 7000 species exist within this division in either a unicellular or multicellular structure. Euglenophyta algae are primarily unicellular and are freshwater species. Over 800 species belong to the Euglenophyta division, however all forms are microscopic. Reduction of efficiency and performance on boats. Algae can frequently build up on the hull and drive systems of boats, which reduces lubricity and increases water friction of the boat. This results in the boat becoming less efficient, less powerful and consuming more fuel. Environmental and health risks. Some types of algae, particularly in the Pyrrophyta division, are poisonous and therefore can kill other organisms living in the ecosystem amongst the algae. Expensive to remove algae. Using traditional algaecide chemicals is often a very costly and ongoing process. Fortunately, Efficient Sonics offer a 'fit and forget' alternative with lower running costs, which is significantly better value for money. Aesthetically unsightly. 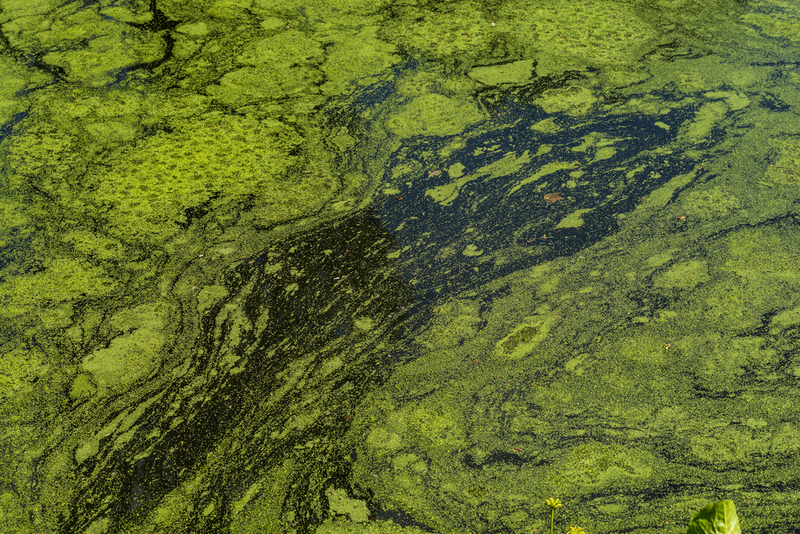 Algae looks very unsightly and is often off-putting in areas where leisure activities take place, for example in boating lakes or swimming pools. Damage to ecosystems and wildlife. The presence of algae in ponds and lakes reduces oxygen levels in the water which can affect its pH level. This can cause plants to die and fish to become infected with parasites, making it often necessary to remove algae in order to protect other organisms. Business disruption. Many businesses such as fish farms and the shipping industry are adversely effected by algae. Fish farms can get clogged up with algae or sea weed, and the costs of replacing nets or cleaning aquaculture systems are very high. Ships suffer similar problems to boats, whereby algae and other marine fouling builds up on the hull and causes a lack of lubricity which compromises the performance of the vessel. The effects of ultrasonic treatment can be clearly seen when using a standard light microscope with 400 times magnification. Figure 1 highlights how vacuoles in cells are severely damaged following the use of an ultrasonic device for 14 days compared to Figure 2, which has not received treatment with an ultrasonic device. Efficient Sonics offer reliable, eco-friendly products, which have a low operating cost using innovative technology that both prevents and controls the spread of algae. 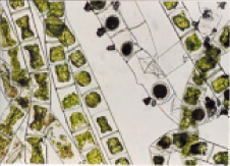 The transducer projects a powerful ultrasonic wave through the water, which upon reaching the centre of the algal cell, causes excessive pressure to build up in the vacuole. Once pressure has exceeded a critical threshold it ruptures the cell vacuole causing the algae to die. The dead algae usually decompose within seven to ten days, whilst filamentous algae may take up to eight weeks to dissolve completely. However, this depends on the existing ecology in the water. A similar process destroys bio-film which prevents the growth of harmful bacteria such as Legionella or E-Coli in the water. The transducer emits ultrasonic waves with a forward opening angle of 90 to 180° to ensure a wide area of water is actively targeted. The range and strength of the signal emitted depends on which model you have chosen from the extensive Efficient Sonics product range. However, the ultrasonic signals used are harmless to humans, animals, fish and aquatic plants . It is not effective against aquatic plants, such as duckweed, water meal, eelgrass, milfoil, and chara. Once algae have been exposed to the ultrasonic waves from the Efficient Sonics device it dies and begins to turn brown, which is a good indication of dying or dead algae. The same process occurs with filamentous algae, although it often takes longer due to its more complex structure. Algae that is physically attached to surfaces like string algae for example, should detach and rise to the surface of the water. When the algae dies, decomposition starts and gasses build up within the algae mass which causes it to float to the surface. This incidentally, offers the best opportunity to remove the dead algae from the water, which would otherwise provide nutrients for a repeat algal bloom. The algae remaining in the water then turns brown, releasing the gasses and sinks to the bottom of the water where further decomposition occurs. However, since the decomposing algae remains in the water it will prevent the water from becoming clear. Additionally the bio-film (slimy bacterial layer) on any surface in the water will completely dissolve causing any fungus, pathogens or bacteria in these areas to be eliminated. When installing your Efficient Sonics ultrasonic transducer, it is important to consider positioning in an optimal location, away from reflecting surfaces, to allow maximum sound projection from the front face of the unit into the water. However, if the transducer is badly located, the projected acoustic wave can be reflected from nearby walls, slopes or other surfaces causing loss of sound energy due to destructive interference. In this case, collisions can occur between the ultrasonic waves travelling forward and those reflected from nearby surfaces travelling in the opposite direction, resulting in possible cancellation of the acoustic signal and reducing the effectiveness of the ultrasonic device. Scientifically proven technology. There are many studies assessing ultrasound technology in various different applications, and they provide overwhelming support for ultrasonic systems being unrivaled solutions for algae prevention and removal. Guaranteed reliability. Our range of products are some of the most reliable on the market, and for further peace of mind a portable Ultrasonic Meter is available so you know your device is operating effectively at all times. Chemical free. The Efficient Sonics product range offers an eco-friendly alternative to using environmentally damaging chemicals when remediating and preventing algae growth. Improved water quality. When using an Efficient Sonics product, whether in a pond, fish farm, lake, or reservoir, algae growth will be inhibited and water quality will improve due to re-oxygenation. Improved health for wildlife. Strong evidence suggests that Efficient Sonics products improve the health of wildlife in a pond as they assist the pond in becoming a more hospitable ecosystem. Maintenance free. No maintenance is required with any of the Efficient Sonics product range, ensuring you do not have to move or alter the device once it is installed in your pond. It is truly 'fit and forget'. Highly effective. Our Smart Tune Technology ensures an optimum ultrasound frequency is always emitted, keeping your entire pond algae free as opposed to having only areas within close proximity to the device being cleared. Helps reduce obstacles for businesses. 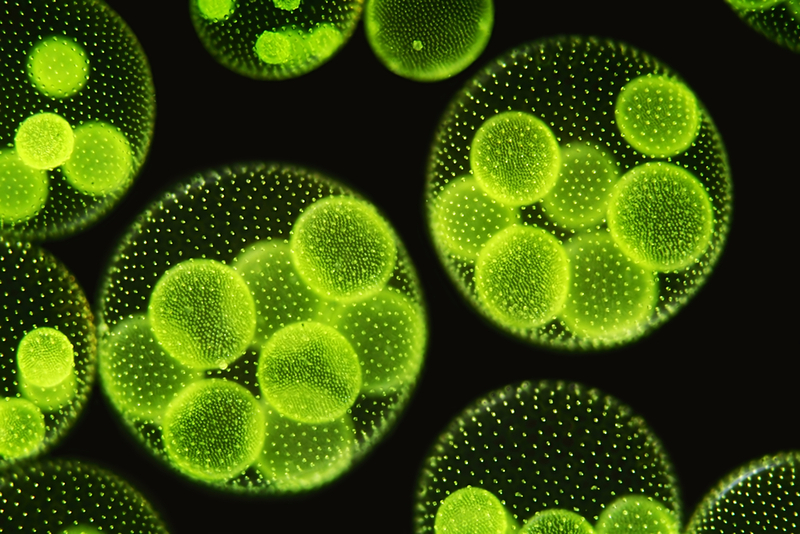 By preventing and eliminating algae in an eco-friendly and cost effective way, Efficient Sonics can help industries such as fish farms and shipping avoid disruption caused by algae. Improves boat and ship performance. The innovative ultrasound technology offered by Efficient Sonics can effectively prevent and remediate algae build up from the hull and drive systems, which increases lubricity and helps maintain fuel efficiency. Prevents and treats algae: Unlike chemical alternatives, our pioneering dual-action products both remove algae and continue to prevent algal build-up.